Posted on 7/5/2017 by Lori Moriarty. 0 Comments. 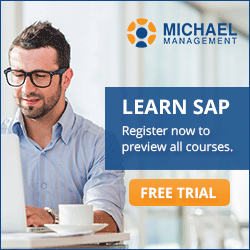 How is your corporate SAP training program doing? Over our years of delivering award winning SAP training to students around the world, we have learned what makes SAP training more palatable for learners. Here are some tips backed up by solid information to help improve your SAP training program right now. The first thing that we know is that you should allow students flexibility in their training times and lesson duration. There needs to be short interval options. We have found that 49.6% of SAP professionals think that the sweet spot for training lessons hovers around 30 minutes and up to an hour. The lessons must be short so that people can shoehorn their training into their already busy schedules. We keep our lessons to 25 minutes or less. In addition to the on-demand lessons within a more detailed course, we also offer shorter SAP training boot camp lessons so a student can get a quick refresher in under an hour. And for more inspiration, take a look at these five no excuse tips to get you going and keep you going in your corporate training in SAP Training – Done in Less Than 7 Hours. We discovered that 44% of our SAP professionals believe that they can’t fully perform their jobs because they haven’t received enough training. A great part of any training program is the reward. By implementing an effective SAP training program, you will give your employees the opportunity to do a better job. That translates to a happier workforce. When you give your student a reason why they will benefit from training, then you will have that all important buy-in and they will want to take the training. Getting superior training is a necessity in today’s workforce. You can read more about it here in To Be a Savvy Professional You Need SAP Training. Make your training fun & hands-on. Yes, SAP training can be enjoyable. Nobody likes to go through hundreds of Power Point slides. Time to upgrade to the Internet age and use modern online training. In fact, 67% of SAP professional say they prefer to receive their training on-line through eLearning. When learning an already complicated thing like an SAP system, there is no room for meaningless buzzwords. We use plain English and hands-on simulations in our lessons. It is learning by doing. In addition to the student seeing the SAP screens, they can click, enter data into fields, use menus and navigate around the various screens. To reinforce the lessons, we use video with an instructor explaining certain features, printed words for those who like to read to remember and quick knowledge checks along the way. These techniques work together to fully immerse the learner so the information sticks. Take these great tips and put them into practice in your new and improved SAP training program. Or, you can let us do all the heavy lifting for you and talk to us about our incredible corporate SAP training program. What can you do today to improve your training plan? Let us know in the comments below.